↑ Nakamura, David; Wagner, John (May 10, 2018). "Trump announces June 12 summit in Singapore with North Korean leader". The Washington Post. 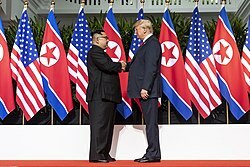 https://www.washingtonpost.com/politics/trump-announces-june-12-summit-in-singapore-with-north-korean-leader/2018/05/10/8f1ad3ac-5438-11e8-9c91-7dab596e8252_story.html. अन्तिम पहुँच तिथि: May 10, 2018. ↑ "Trump leaves open possibility of Jun 12 Singapore summit with North Korea". Channel NewsAsia. May 25, 2018. https://www.channelnewsasia.com/news/asia/trump-kim-summit-in-singapore-could-still-take-place-10278898. अन्तिम पहुँच तिथि: May 25, 2018.